Seamus Heaney and Eavan Boland, two of Ireland’s foremost contemporary poets, reflect on the precariousness of the Irish lower and middle classes through two of the three mainstays of their nation’s literature: Irish history (or past in Boland’s view), and rural life (the third being mythology, which is not represented in the traditional sense). However, their treatments of these classic themes are not synonymous with what Irish writers in the revivalist period aimed to accomplish, which was to glorify Ireland and her people in order to create a national literature. Conversely, Heaney and Boland’s poems are meant to expose the fragility of the Irish way of life and the injustices that its people have suffered, whether it be through ecological precariousness, civil unrest, or British imperial oppression. Yet Heaney and Boland starkly contrast in what they focus on in their poetry, and this departure in poetic meaning is seen particularly in the relation between Ireland’s past and how it affects the contemporary Irish individual. Although in spite of the differences, there is much continuity in subject matter between the two poets, such as the similarities in dealing with precariousness, ecology, and manual labor in Heaney’s “Digging” and “The Forge”, as well as in Boland’s “Quarantine” and “That the Science of Cartography is Limited”. Meanwhile, Boland’s poems portray little accomplishment in the pursuit of manual labor. In “That the Science of Cartography is Limited”, the futility of hard work that Boland describes through the existence of an unused famine road, (which is inexistent on the map) displays a negativity that borders on nihilism. Boland associates the Irish landscape with melancholy and pessimism, instead of the resiliency that Heaney portrays, which can be seen in the first stanza of the aforementioned poem, “the gloom of cypresses \ is what I wish to prove.” Not only does Boland wish to prove the sadness surrounding dying without a name (which the cypress trees symbolize), but that the Irish past is filled with the forgotten suffering and poverty that has not been given the justice of even being acknowledged on a map. This means that the story of Ireland is not fully told, which is why Boland differentiates between the words past and history, in that Irish history is a mythologized version of the past that fails to even make note of the vulnerable existence and suffering of the common people. Hence, Boland is dealing with the individual’s view of the past and the relation between that and a distorted societal perception of history. This mode of thinking is unusual in that it is retrograde, unlike in Heaney’s “Digging”, where instead of the present having an effect on the view of the past, the past causes a development, which is acknowledged and appreciated in the present. Heaney capitalizes on overcoming poverty in “Digging”, as his family gradually ascends from the lower to the middle class through two generations. Heaney experiences the fulfillment of his father and grandfather’s determination and hard work in their manual labor through comfortably making a living with writing. This is in stark contrast to the precariousness of the agrarian working life which Boland portrays, resulting in the full collapse that was experienced by the nameless laborers in “That the Science of Cartography is Limited”. “Digging” begins with Heaney watching his father enjoy retirement by digging in the garden, which is a hard-earned comfort, and ends with Heaney recognizing that being able to write for a living instead of farming is due to the efforts and ascendency of his ancestors. In this recognition, the poet associates his pen with the spade of his forefathers, exclaiming that he will dig with his tool into the past in order to spread the story of Irish resilience and determination in hard work. Heaney also realizes that his father and grandfather’s economic rise was not completely smooth or guaranteed, because the threat of the bleak Irish ecology always looms upon the agrarian laborer, which Heaney simply shows by mentioning the “smell of potato mould”, a reference to the blight which caused so much death and misery portrayed in Boland’s poems. “In the morning they were both found dead. \ Of cold. Of hunger. Of the toxins of a whole history.” Boland reverses the meanings of history and myth in her ode to two lovers, a simple but profound poem called “Quarantine”. That the couple the poem focuses on were not specific people proven to exist means that history as a subject based upon facts is irrelevant to the lives of common people who have not had the chance for their stories to be told. 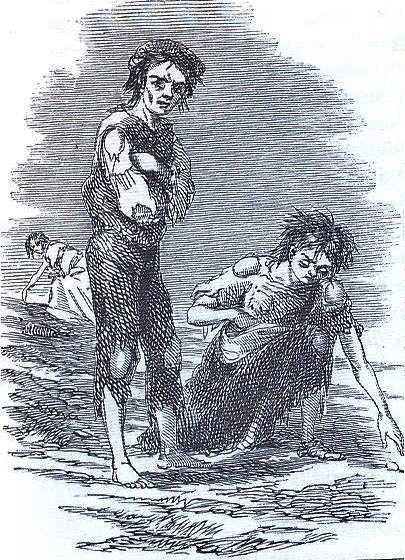 Not only did the toxins of history, or the British policy failures and economic fragility that led to the Great Famine, cause an untold amount of death to the Irish people, but the toxins also wiped away the names and stories of these people. Thus, the lives (or the actual past) of the suffering masses reverted to myths, or otherwise became something that can only be speculated upon in hindsight. The distortions of history and myth that Boland reveals in “Quarantine” is essentially a role reversal, in that Irish history is an incomplete story that does little justice to the actual past in which the story of two nameless lovers is raised to a legendary, mythical status. This is seen in the climax of the poem, where Boland describes a final act of love between the ordinary man and woman that transcends words, “But her feet were held against his breastbone. \ The last heat of his flesh was his last gift to her.” Leading Boland to proclaim “Let no love poem ever come to this threshold.” The love between a dying man and woman in “Quarantine” is a departure from the nihilistic leanings of “That the Science of Cartography is Limited”, because Boland portrays the lovers’ demise as a dignified death, an applied Irish characteristic akin to the dignity Heaney gives his characters in both “Digging” and “The Forge”. Heaney’s poems are dealing with the metaphorical death of an agrarian lifestyle, as opposed to the actual deaths of people, which is the focus of Boland’s poems. “The Forge” is a portrayal of a decaying lifestyle manifested by the rusting of “old axles and iron hoops”. The withering away of the traditional Irish rural life causes the disuse of the blacksmith’s forge to the point of mythologizing the anvil by associating it with being “horned as a unicorn”. Unlike Boland’s use of myth in which all security has collapsed however, Heaney’s blacksmith is still working the bellows, even though his economic position is extremely precarious in a modern industrial world run by machinery. Nostalgia for the traditional Irish way of life is clear when the blacksmith looks out the door, into the past and “recalls a clatter \ Of hoofs where traffic is flashing in rows; \ Then grunts and goes in”. Heaney delineates the blacksmith in “The Forge” in such a way as to have the reader sympathize with the character and his dismay of widespread modernization. Thus Heaney is able to represent two sides of the same coin when it comes to dignity and labor in modern Ireland, the benefits of which as seen in “Digging”, and the negative effects on the blacksmith, who is determined in “The Forge” to pursue a profession which is seemingly anachronistic in the modern world. The precariousness of Irish life displayed in “The Forge” is a story of economic failure, where a man who makes horseshoes is no longer needed in a land now filled with cars. This is in contrast to the economic ascendency from poverty to comfort experienced by Heaney’s family in “Digging”, which still shows the vulnerability in the Irish rural life in its fading importance, and by referencing the fearful past potato blight. Precariousness as a theme leans towards a full collapse of ecology in Boland’s poems, beginning with poverty and ending with death in both “That the Science of Cartography is Limited” and “Quarantine”. Both Heaney and Boland deal with the mythologizing of Irish history or past, and their poems resonate with the theme of precariousness in showing the fragility of the Irish land and people. However, the poets differ in the degrees and contexts in which they portray the precarious Irish lifestyle, as Heaney references the past in order to emphasize the changing contemporary Irish way of life, and Boland focuses on the perception of the past in an attempt to create justice for those who have suffered due to poverty and famine. The Great Famine killed over a million people, and caused a massive diaspora of the Irish people. The British government’s response came only after the potato crop failed for two years. British officials decided to only give relief to those whom would work on building roads to nowhere, even though many were too weak from the famine. Used to be resistant to the cold. Used to turn some nothings into somethings. And then there was the end of them. An abstract withering of what once was.